Eucalyptus is a popular evergreen that is native to the state of Tasmania in Australia, and is now cultivated across the U.S. and many Mediterranean countries. Eucalyptus is a sought-after superfood due its high nutritional content and many health benefits. 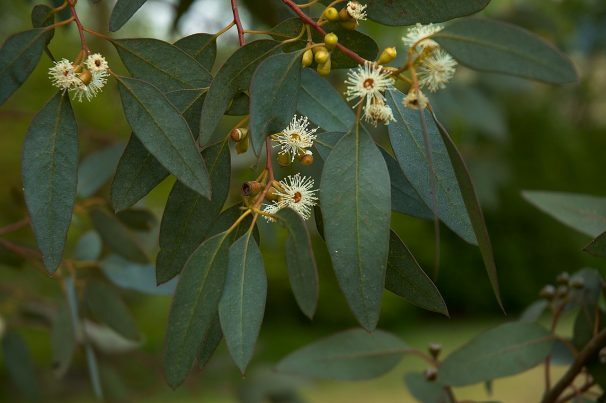 The tree is also known as Tasmanian blue gum, ironbark, bloodwood, and gum tree. Eucalyptus is best known for its positive effects on the body’s respiratory system. The tree’s leaves and essential oils have been used for generations to rid the respiratory tract of catarrh. The active ingredients found in eucalyptus leaves are also known to contain expectorant properties that help eliminate excess mucus and phlegm from the sinuses and respiratory tract. This in turn prevents bacteria and pathogens from multiplying in the respiratory system. Eucalyptus leaves and extracts have long been recommended to address various respiratory disorders including bronchitis, colds, and flu symptoms. The plant is also renowned for its anti-inflammatory properties that alleviate pain. Eucalyptus is commonly given to people who experience muscle and joint pain such as strains and sprains, arthritis, bruising, and backache. The plant is also prescribed for people with asthma, chronic muscle strain, and arthritis. Likewise, its soothing effects provide cardiovascular protection and reduce the risk of atherosclerosis, heart attack, and stroke. On the other hand, the plant’s antimicrobial properties stave off bacterial infections such as E. coli and candida albicans. Eucalyptus is widely used against fungal infections and skin wounds as well. In addition, eucalyptus is a potent superfood against anxiety and stress. The plant is touted for its natural sedative properties that alleviate chronic stress and ease mental tension. Aside from this, the superfood is touted for its potential in diabetes management and prevention. The plant is found to contain properties that help lower the body’s blood sugar levels. However, it is recommended to consult a physician first before consuming eucalyptus tea to manage the disease or prevent its onset. Moreover, eucalyptus is notably effective in promoting the skin’s health. The plant’s antimicrobial properties help alleviate various skin conditions such as acne. Eucalyptus is also known to be a powerful detoxifying agent that effectively cleanses the liver and the kidneys. Likewise, the tannins in eucalyptus are known to contain tissue-constricting effects that are ideal in treating bleeding gums. While eucalyptus contains many health benefits, health care professionals caution that its essential oils are extremely potent and might actually be toxic if taken undiluted. Eucalyptus supports the immune, respiratory and nervous systems. The plant is also beneficial to the cardiovascular, skeletal and muscular system. Likewise, the plant’s antioxidant content fortifies the digestive system and promotes healthy skin. Eucalyptus is primarily cultivated for its essential oils that are used in a variety of treatments. The leaves of the eucalyptus tree can also be made into infused tea that soothes sore throats and treats colds and flu. Other applications for eucalyptus include paper pulp and many over the counter products such as creams and ointments. Eucalyptus prevents respiratory diseases, fungal and microbial infections, and chronic pain. Eucalyptus staves off chronic stress, diabetes, and cardiovascular diseases. Eucalyptus keeps various skin disorders and oral diseases in check. Eucalyptus supports the immune, cardiovascular, respiratory, and nervous systems. Eucalyptus is beneficial to the skeletal, digestive, and muscular systems.